Young chef David Toutain, who hails from Normandy, is one of the leaders of a new class of chefs mimicking abstract artists (such as Miró) who cared very little about texture and structure and found their way in abstraction. The minimalist décor features tables and chairs made of raw timber. Meanwhile, the plates are brilliantly colored or plain to match each dish. The bias here is “aesthetics” first, but le tour de force is that the aesthetic choices fit the balance of flavors very well. Colors and shapes underline and enhance the tastes. Lashes of chopped squid form the bed for shallot confit and cébette (a variety of onion) surrounded by spots of ink. Squab comes with red beetroot, multicolored flowers and nasturtium leaves spiced with turmeric. The artist and the gourmand are both satisfied. David Toutain, 29, rue Surcouf, 75007 Paris, 01 45 50 11 10. Nestled into the mall of the Beaugrenelle quarter, modern brasserie Eclectic features a huge terrace and a décor conceived by a renowned designer, the English-born Tom Dixon. The dining room sprawls over different levels, with alcoves and banquettes facing bay windows. Expect an eclectic fare indeed: oysters, sea bream carpaccio, several steaks including Châteaubriand, a cheeseburger, and even daily suggestions like roasted chicken on Tuesday. 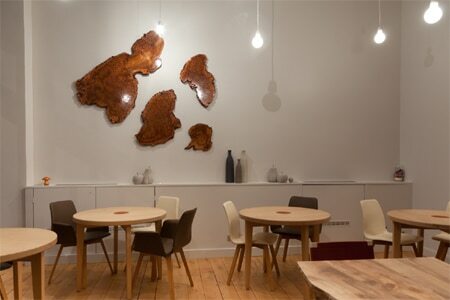 Eclectic, Beaugrenelle 2, rue Linois, 75015 Paris, 01 77 36 70 00. Will, a neighborhood bistro from William Pradeleix, greets patrons in a tiny room endowed with 34 seats and decked out with green banquettes. Expect French favorites with Asian flavors, meticulous presentations and clever seasonings. Depending on the catch of the day, the menu may include veal tataki with beetroots in a consommé, steamed cod with shiitake and green curry, and a simple but tasty chocolate tartlet with praline. Will, 75, rue Crozatier, 75012 Paris, 01 53 17 02 44. According to reports, Yannick Alléno, who quit Le Meurice in 2012, will replace Christian Le Squer at the helm of Ledoyen in August. Presently, Alléno owns two restaurants in Paris, Terroir Parisien, respectively in the 2nd and 5th arrondissement, and oversees the dining place of Molitor, a new hotel established in a former swimming pool in the 16th arrondissement. Ledoyen, 1, ave. Dutuit, Paris 75008, 01 53 05 10 00.